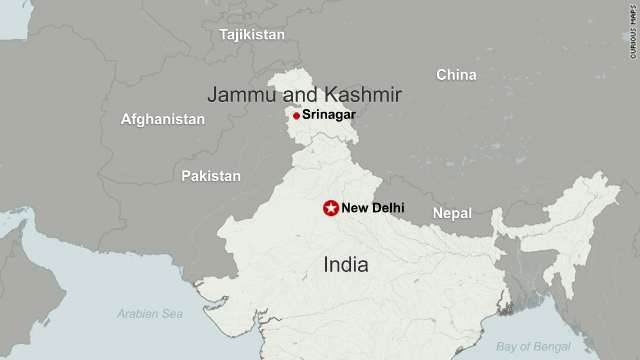 Srinagar, India (CNN) -- A drawn-out gunfight between two militants and Indian security forces ended Thursday afternoon after the insurgents were gunned down inside a hotel in Srinagar's Lal Chowk area, authorities said. Indian security forces stormed the hotel after a heavy exchange of gunfire that began at dawn Thursday, and capped off a standoff that lasted more than 22 hours. "The operation is over. Both the holed-up terrorists have been killed. We are now searching the area," said Farooq Ahmad, inspector-general of police of the Kashmir Zone. A police officer and a civilian were also killed, he said. Eight civilians and two Indian paramilitary troopers were injured. The militants set the hotel afire as security forces stormed the building, Ahmad said, adding that firefighters kept the blaze from spreading in the congested business area. The standoff started Wednesday afternoon after two attackers hurled grenades and fired at a paramilitary camp in the heart of Srinagar. The militants later entered the nearby hotel, which police and paramilitary forces immediately surrounded. The Jamiatul Mujaheedin militant outfit has claimed responsibility for the attack, which came a day after the state chief minister, Omar Abdullah, said that violence had seen a downslide in the past year of his leadership.